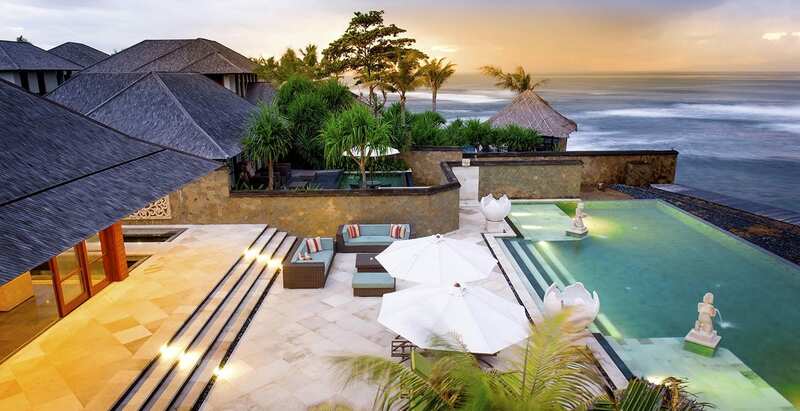 Nestled on the edge of an unspoiled beach in the village of Saba on Bali’s southeastern coast, The Ylang Ylang is an impressive 6-bedroom villa offering elegant grandeur and sweeping ocean views. 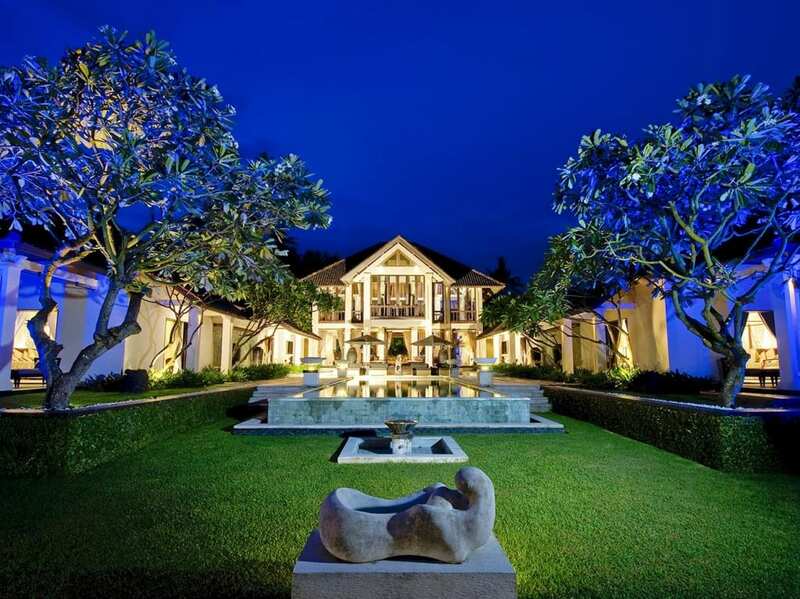 The design incorporates contemporary Asian elements, traditional Balinese touches, and European sophistication to create a series of spaces that are both opulent and deeply soothing. The ultra-luxe facilities include a 15-metre salt water pool overlooking the ocean, a home theatre, gym, and infrared sauna. Add to this a team of discreet and attentive staff to pamper each and every guest, and it’s no wonder The Ylang Ylang attracts celebrities and royalty. 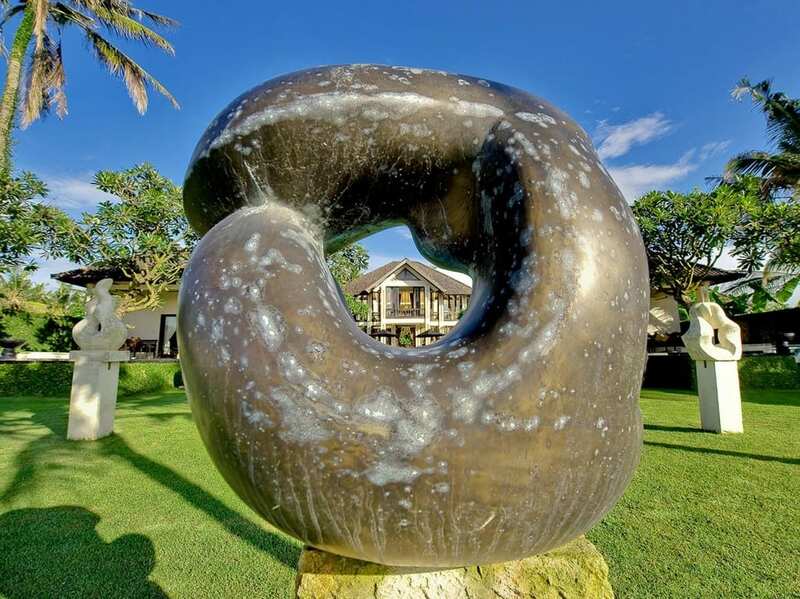 ‘Passionate serenity’ is the mantra at The Ylang Ylang— a lifestyle philosophy that is easy to embrace amid the gorgeous gardens and secluded seaside environs of this 6-bedroom villa. From the living pavilion with its soaring ceilings and silk-draped daybeds to the tastefully decorated bedrooms, the interiors here are the first word in luxury. 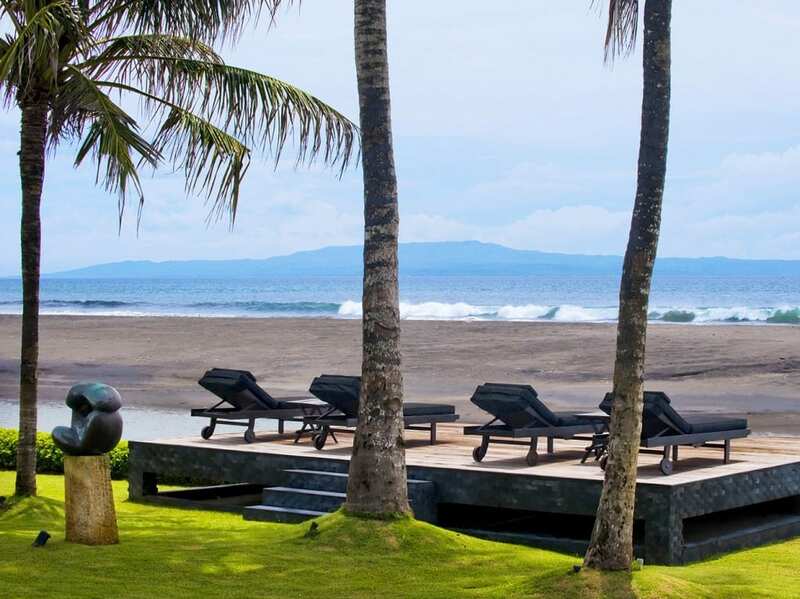 Then you have a beautiful salt-water pool with Chanel towels on offer, a private gym with a sauna, an al fresco dining area next to the black sand beach, and a riverside relaxation bale with views across the Badung Strait. Simply put, this is pure holiday perfection. 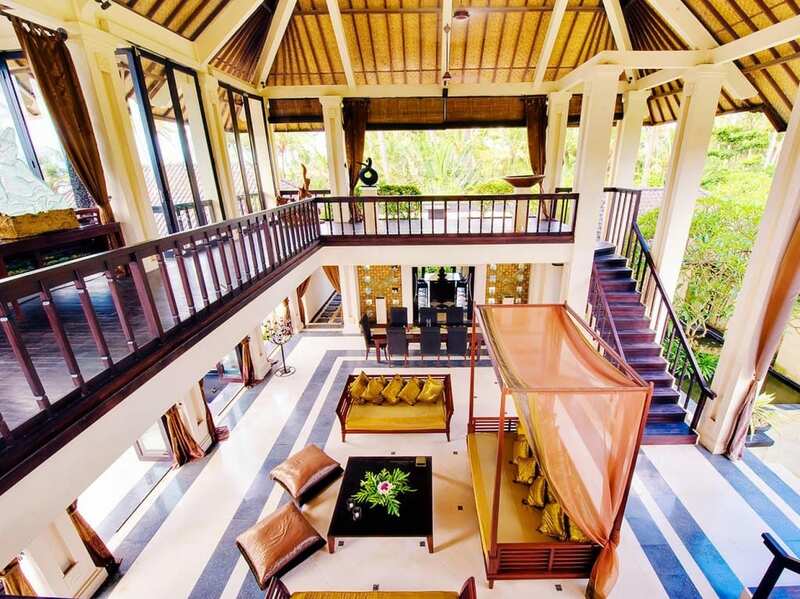 The Ylang Ylang’s social hub is its lofty two-storey living and dining pavilion that overlooks the gardens, pool, and ocean. 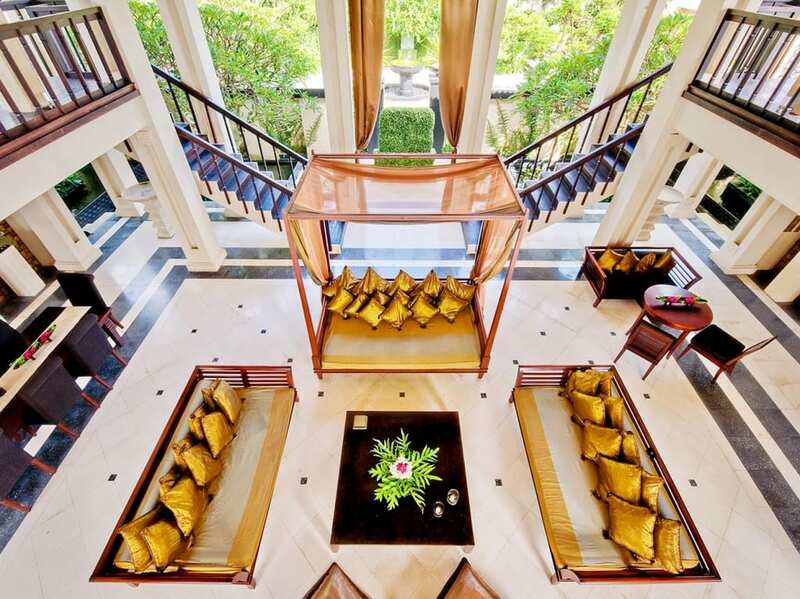 The entrance opens to an 11-metre high atrium with huge colonnades supporting the vaulted ceiling and a gorgeous living room with inviting daybeds embellished with gold cushions. 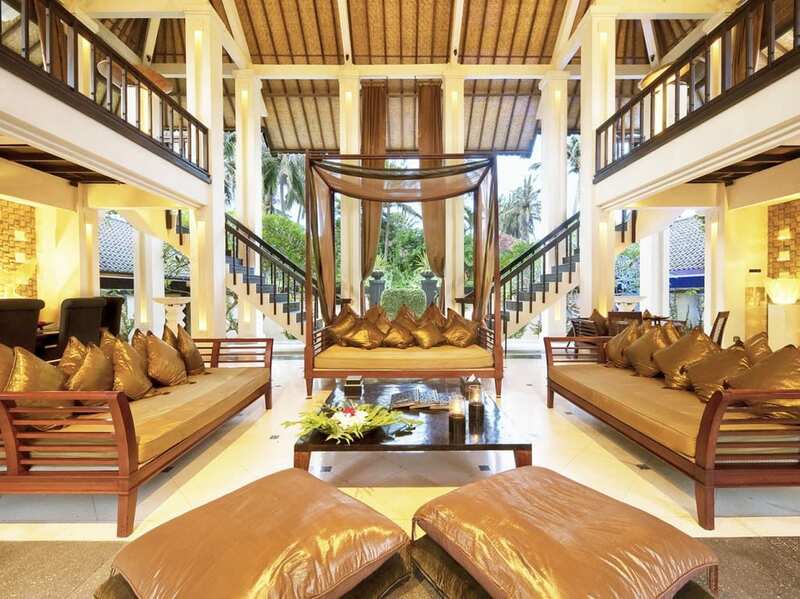 The living room is open-sided, but protected from the elements with huge wooden doors, silk curtains and bamboo blinds. At one end you have a lovely dining area with a lacquered wood table that can seat up to 14 people, and on the other large doors lead to the air-conditioned home theatre with its huge sofa bed, library, and work area with a computer. On the either side of the palatial living room there are black lacquered staircases that lead up to a mezzanine-style deck. Here you will find a bright airy space with two dining tables. Folding glass doors open to a balcony with an oversized daybed offering amazing views over the gardens and out to the ocean. On clear days you can see neighbouring Nusa Penida across the water. On one side of the balcony there is a rooftop deck with floor cushions, and on the other a spa treatment room with two massage tables. For those who want to stay fit on holiday, there is also a small glass-fronted gym with an infrared sauna in the garden. The guest suites at The Ylang Ylang are housed in two symmetrical single-storey buildings that flank the pool, and the master suites can be found at either end of these buildings closest to the ocean. Each luxurious air-conditioned master suite has a beautiful terrace with outdoor furniture, drapes for privacy and a private plunge pool overlooking the ocean. Inside there are four-poster king beds, sofas upholstered in silk, satellite TVs, DVD players, and ensuite bathrooms with sunken bathtubs and walk-in rain showers. Set back from the master suites are two air-conditioned queen suites with four-poster queen beds and light-filled ensuite bathrooms with mini-sunken bathtubs and showers under glass panels in the roofs. The queen suites have sliding doors that lead to adjoining junior suites, each with twin beds and ensuite bathrooms with showers. These rooms are perfect for families with children. 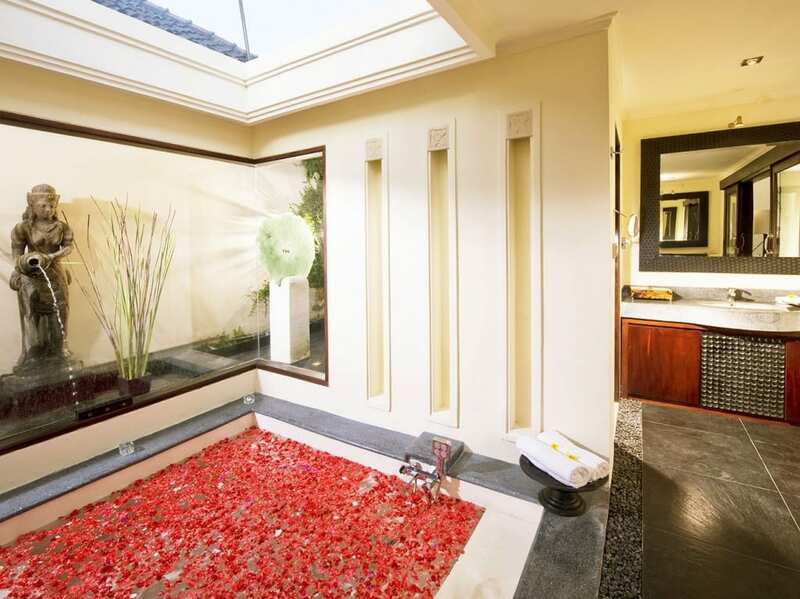 The guest suites also have private patios with reclining loungers surrounded by greenery. At the centre of The Ylang Ylang’s expansive manicured lawn is the 15-metre salt water pool with ornamental water fountains. 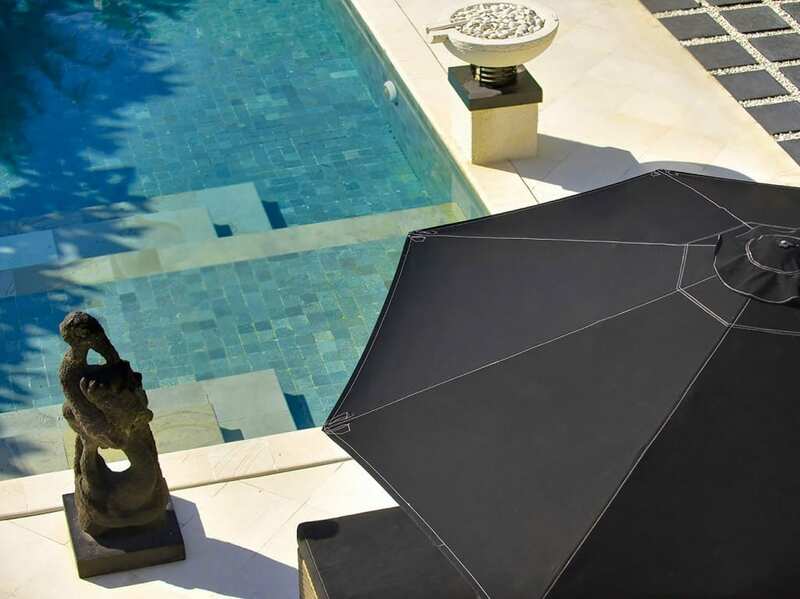 The pool is surrounded by a stone sun deck with comfortable sun loungers topped with mattresses and silk cushions. Head towards the ocean and you reach a timber sun deck next to a tidal river that flows into the sea. 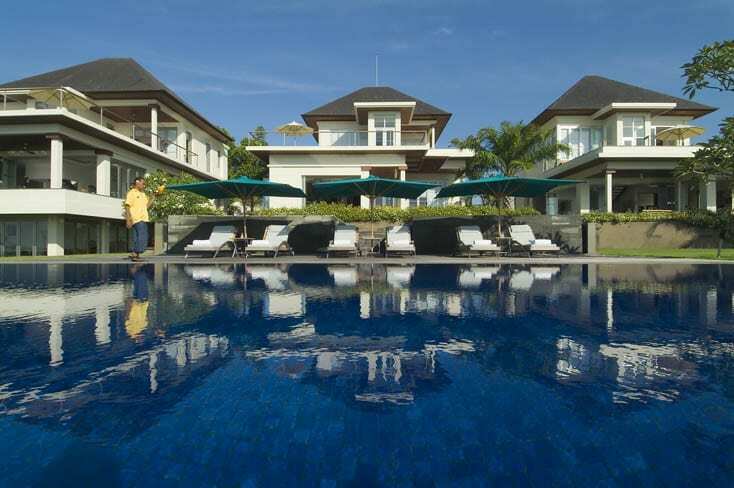 Here you will find more sun loungers with incredible views across the Badung Strait. On one side of the sun deck is a dining pavilion just steps from the sand, and on the other side a pavilion that was designed with seaside massages and relaxation in mind. Saba Village, Ketewel, south-east Bali, Indonesia. CAPACITY 12 guests (6 bedrooms: 2 master suites with king beds; 2 queen-bedded suites; 2 twin-bedded suites convertible to Kings) plus 2 baby cots. Extra beds are available on request at additional cost. LIVING AREAS Two-storey main pavilion with living–dining area; fully-equipped kitchen; theatre room and upper gallery with spa and massage deck plus meditation deck; 2 garden balés. POOL 15 x 5 metre saltwater pool. 2 plunge pools. STAFF Full-time manager; senior housekeeper–butler; maintenance man–butler; chef; kitchen assistant; junior housekeeper; gardener; 2 security guards. Additional staff (e.g. spa therapists and babysitters) available on request for an extra charge. 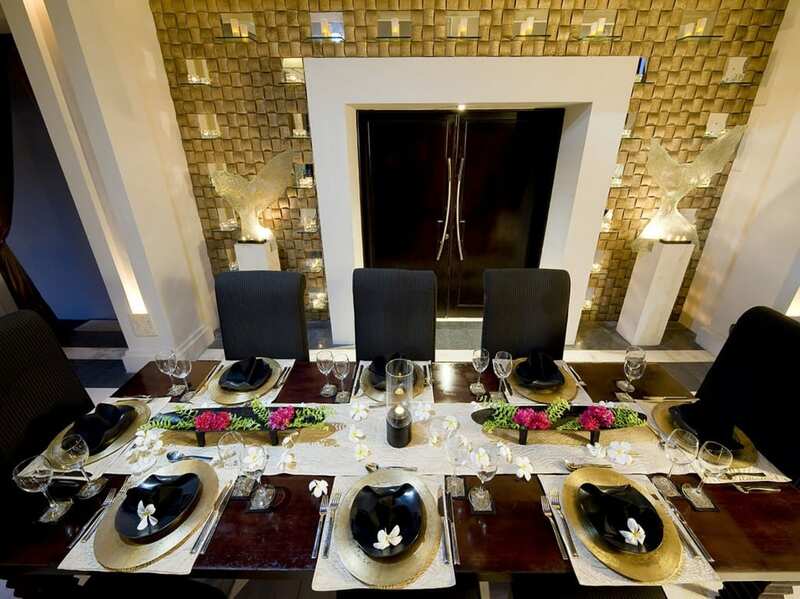 DINING Accomplished chef, experienced in fine-dining and entertaining, with wide repertoire of international and Asian dishes from healthy to decadent. COMMUNICATION Complimentary WiFi throughout; computer and printer; complimentary local calls + in-house telephone system (room to room); IDD calls on request (extra cost). ENTERTAINMENT Satellite TVs and DVD players in master suites and theatre room; extensive DVD library; CD players in bedrooms and theatre room; iPod dock in bedrooms; board games,; book library. 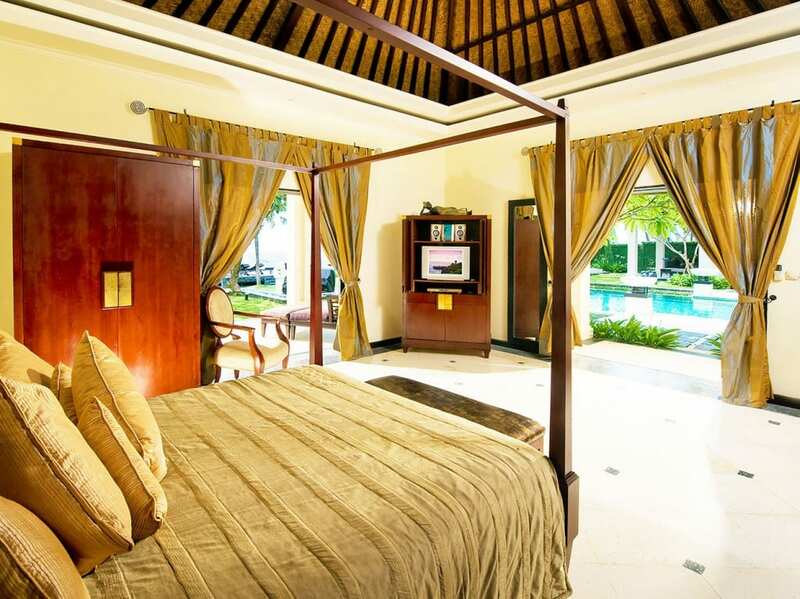 FOR FAMILIES Villa Ylang Ylang is well equipped for families. Facilities include a baby cot, inflatable pool toys and a high-chair. SPA Infrared sauna; gym; yoga mats; massage beds. Spa and yoga services available on request (extra charges apply). WEDDINGS & EVENTS Weddings and special events for up to 70 people standing (50 people sitting) can be arranged with prior notice. ADDITIONAL Secure parking for six cars; hairdryers and mini-safes in bedrooms; wine cooler; 3 coffee machines; customised bathroom toiletries; barbecue. PROPERTY AREA 2,100sqm (land area); 1,100sqm (villa). 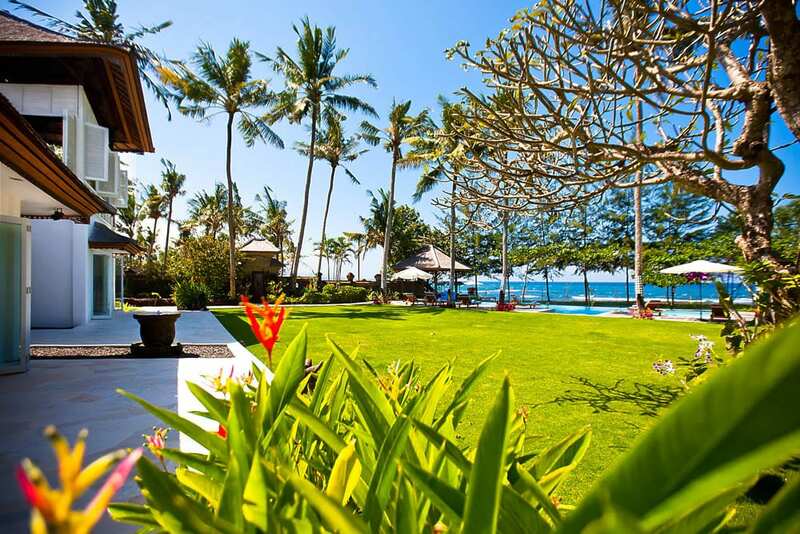 Villa Ylang Ylang rests in the quiet coastal village of Saba, in an area collectively known as Ketewel, within Bali’s eastern Gianyar Regency. This eastern coastal region is an exceptionally wonderful part of the island – naturally beautiful, amazingly unspoilt and packed with cultural and scenic attractions. 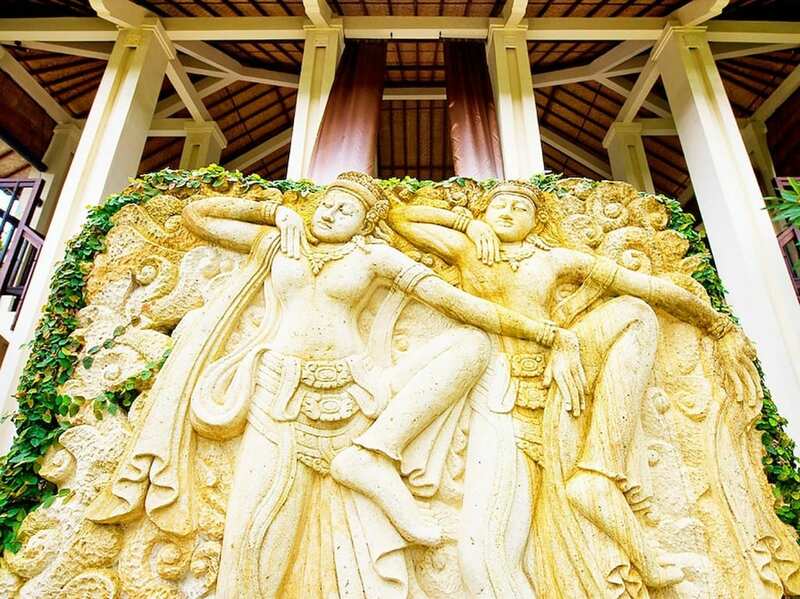 Saba is the quintessianal Balinese village, distinctive with its stretches of emerald rice fields and coconut groves, dotted with a harmonious mix of unobtrusive foreign residences and local dwellings. Villa Ylang Ylang’s gardens stretch down to Saba Beach, with a reminder Bali is a volcanic island, as its sands are shimmering black. The deserted stretch of beach offers unobstructed panoramas with stunning views across the Badung Strait and Nusa Penida, opposite, one of Bali’s smaller sister islands. And on a clear day, the silhouette of towering volcano, Mount Agung, is visible in the distance. Sunrises are a spectacular treat here, especially over Nusa Penida’s limestone cliffs. (It’s worth noting that as Bali is also still a developing country, the beach is sometimes at the mercy of external influences and people’s disregard for the environment). A tidal river flows between the beach and villa; Peanut River alters its course with every changing season, so access to the beach requires crossing the river half of the year by way of a small boat provided by the villa. With strong currents directly in front, it’s safer to swim in a protected bay area just five minutes westwards (or head south to the calm waters of nearby Sanur). The offshore reef here is renowned for its surf breaks, and there’s excellent surfing to be had ten minutes in either direction of the villa: nearby Mascheti Beach has world-class surf breaks and hosts international surfing tournaments. 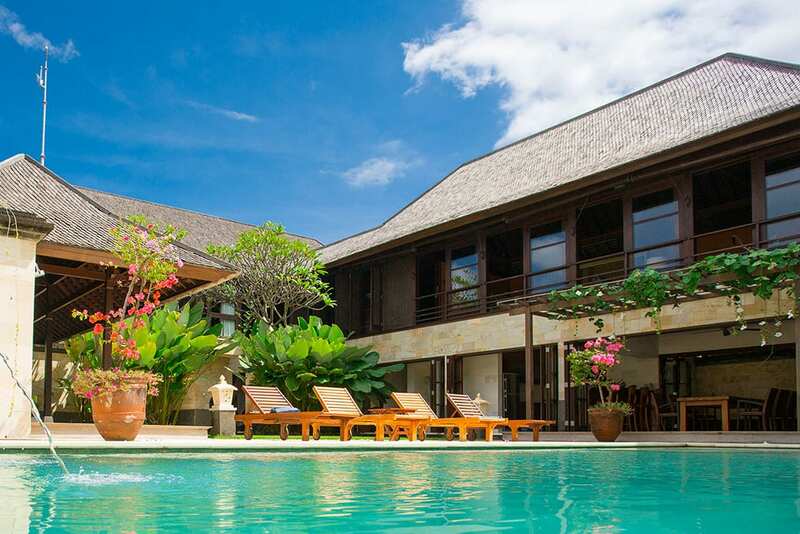 Sanur Residence is a sleek 3-villa, 9-bedroom estate on Bali's south-east coast, blessed with uninterrupted ocean views. Designed for those who love socialising but also enjoy having their own private space for rest & relaxation.